As soon as the weather turns nice, you’ll find us grilling on our patio three or four nights a week and not just on weekends. On weeknights, we love cooking outdoors after being cooped up in the office all day! It gives us both a chance to head outside—hubby mans the grill and I toss together a quick side—and enjoy catching up on our day. 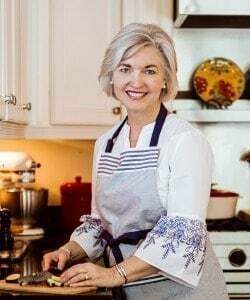 For these weeknight grilling sessions, I like to keep it quick and simple with flavorful, healthy options. 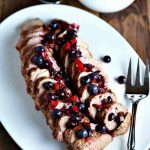 For that, this Grilled Pork Tenderloin with fresh Blueberry Salsa that I first shared over at The Weary Chef is perfect! Here’s my game plan for this quick weeknight recipe. 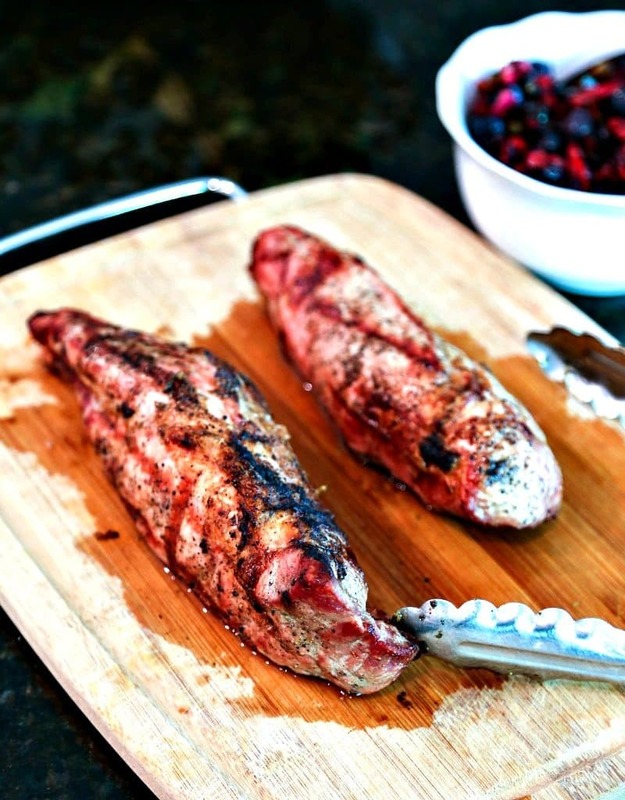 Start with a two-pound pork tenderloin and rub it on all sides with a clove of garlic. Brush the tenderloins all over with olive oil and a generous sprinkle of black pepper. Let this sit at room temperature for 15 minutes while you assemble the salsa and heat up the grill. Rinse and drain fresh blueberries and reserve one cup. Toss the rest in a food processor or blender and pulse a few times to coarsely chop the berries. Be careful not to overdo it! Chop the veggies for the salsa—red onion, red bell pepper, and jalapeno pepper. Add to the blueberries and toss to combine. You can let this set at room temperature while you cook the meat or refrigerate—your choice! Assemble a green salad—make it easy by using a bag of mixed greens and bottled salad dressing! Head outside and watch hubby man the grill and in 35 minutes, start to finish, dinner is served! 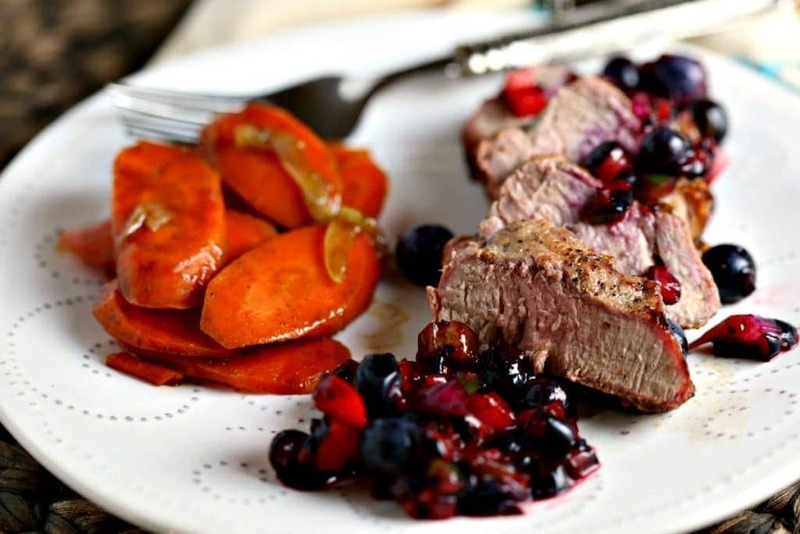 Try the blueberry salsa on chicken or fish or serve any leftovers with tortilla or pita chips. Enjoy, friends! Rinse blueberries and drain well. Reserve 1 cup of berries. 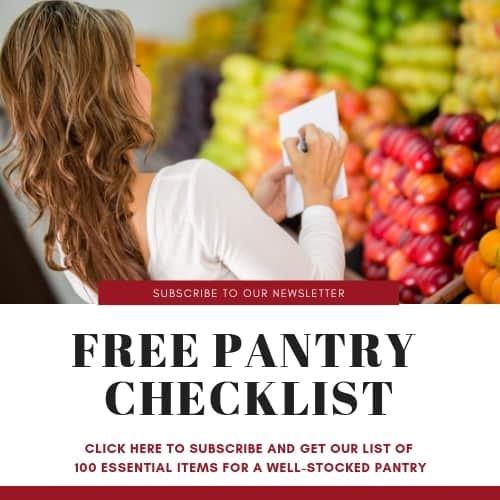 Coarsely chop the remaining 2 cups of berries and place in a bowl with remaining ingredients. Stir gently, cover, and refrigerate until ready to serve. Heat grill to medium heat (350-450 degrees). Slice garlic clove in half and rub over all surfaces of the pork tenderloin. Brush the tenderloin lightly with olive oil and season with freshly ground black pepper. Allow the tenderloin to stand at room temperature for 15 minutes. Grill the tenderloins over direct heat for 15 to 20 minutes, turning every 5 minutes. Keep the grill lid closed as much as possible. Cook until the pork is barely pink in the center. Remove the tenderloin from the grill and let rest for 5 minutes before slicing. 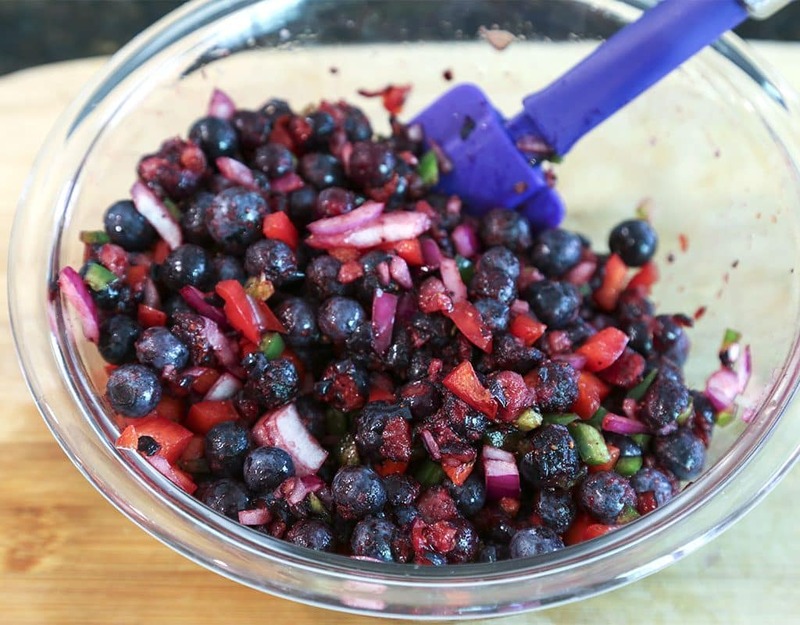 Ladle blueberry salsa over top of slices and serve. 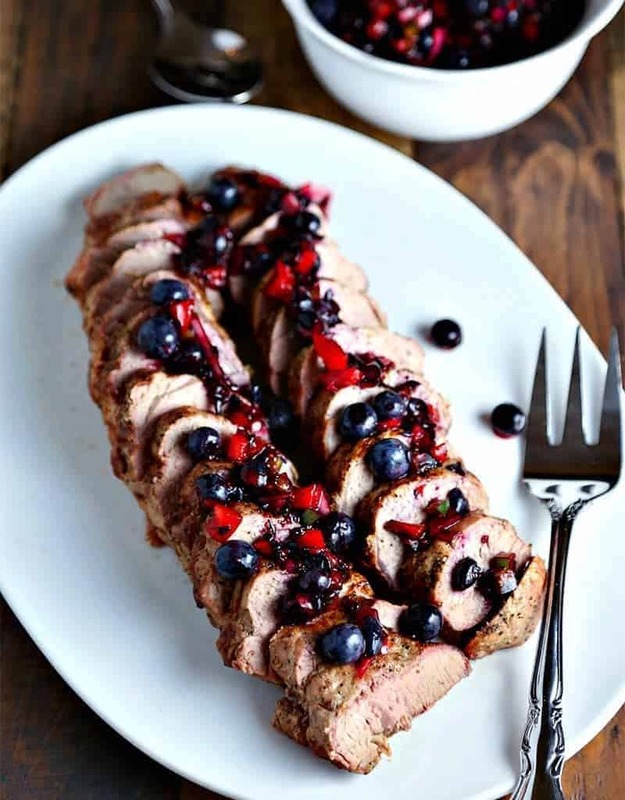 The pork tenderloin with blueberry salsa was OUTSTANDING! Really enjoyed it. Had it with grilled corn on the cob and a strawberry-spinach salad with almonds. Amazing combination of flavors. Thank you for trying my recipe, Dave! Glad you enjoyed it!